US social networking giant Facebook said Wednesday it has partnered with South Korean business agencies to launch a new program to help Korean startups expand overseas with digital strategies leveraging its platform. 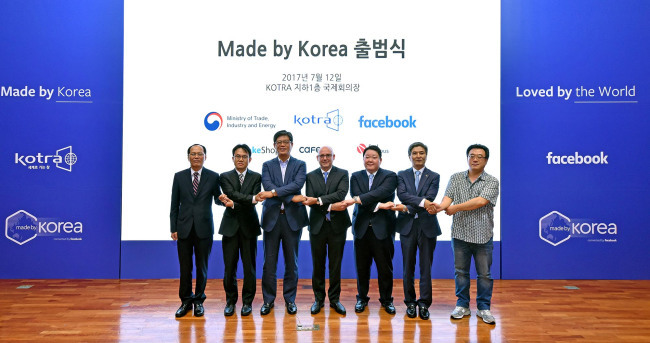 Facebook Korea and the state-run Korea Trade-Investment Promotion Agency introduced the Made by Korea program designed to offer local startups export-related support. Korea’s e-commerce solution providers MakeShop and Cafe24 as well as digital business training institution Fast Campus will also be taking part in the Facebook-led program. Any startup that holds some level of business infrastructure for exports and makes use of Facebook’s digital marketing services are eligible to apply, Facebook Korea said. The startups and small enterprises selected for the program will receive eight weeks of export-related support on subjects including business strategy development, marketing, management skills, advertisement, exporting and licensing. Facebook will provide support for digital marketing strategy development, including how best to make use of Facebook’s marketing solutions, while its partnering agencies will offer support for overall export strategy development and guidance. “Facebook and Instagram excel in terms of digital marketing. However, marketing alone cannot help startups successfully go global. Given this, we’ve joined hands with multiple partners to fill the gaps,” said Facebook’s Asia-Pacific Community Engagement Manager Howard Han. The official launch of Made by Korea comes after a test run of the program earlier this year. In March, 57 local startups, including the character-driven dessert seller Sweet Monster and Eone Korea, which makes watches for the visually-impaired, participated and benefited from the inaugural program. Now one of Facebook’s permanent programs, Made by Korea will be expanded to offer digital-driven export guidance to more than 400 local startups by the year’s end. “Made by Korea and connected by Facebook is a Korea-first program. So far 57 businesses have participated in Korea. We hope to make it a lot more,” said Facebook’s Vice President of Asia-Pacific Dan Neary. Though the program is only available in Korea for now, the US social networking giant is looking to bring the same program to other countries in the future, according to the company. As for potential plans to monetize the program as it grows in size and influence, Facebook Korea said it will continue to keep the program free of any fees for participating startups.